The truth of Advaita Ācārya has been described in two different verses. It is said that material nature has two features, namely the material cause and the efficient cause. The efficient causal activities are caused by Mahā-Viṣṇu, and the material causal activities are caused by another form of Mahā-Viṣṇu, known as Advaita. That Advaita, the superintendent of the cosmic manifestation, has descended in the form of Advaita to associate with Lord Caitanya. 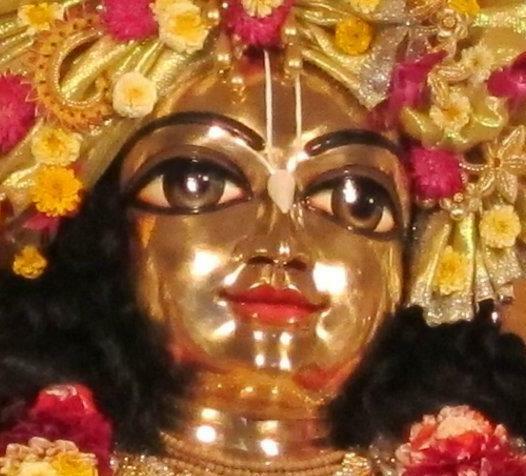 When He is addressed as the servitor of Lord Caitanya, His glories are magnified because unless one is invigorated by this mentality of servitorship one cannot understand the mellows derived from devotional service to the Supreme Lord, Kṛṣṇa. 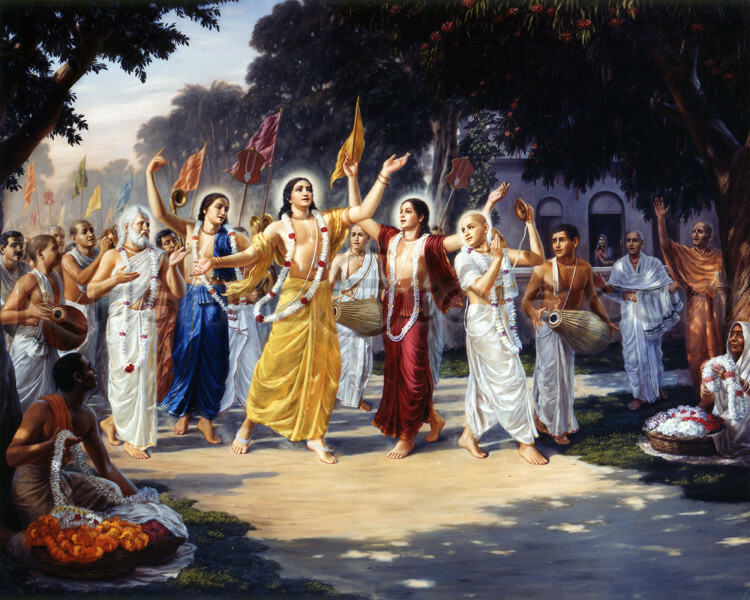 Today marks the appearance of Sri Caitanya Mahaprabhu otherwise known as Gaura Purnima. We will honor it today with a fast till moonrise followed by a feast. 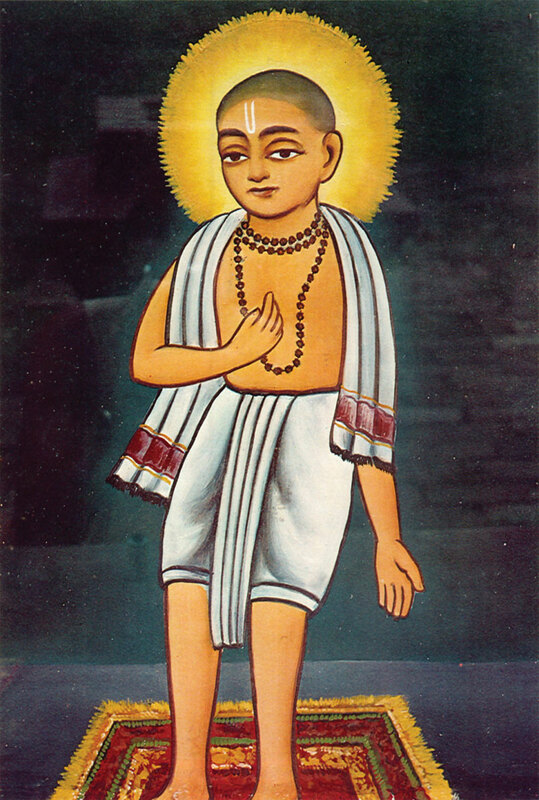 The following post is a beautiful biography on Lord Caitanya, written by Stephen Knapp. 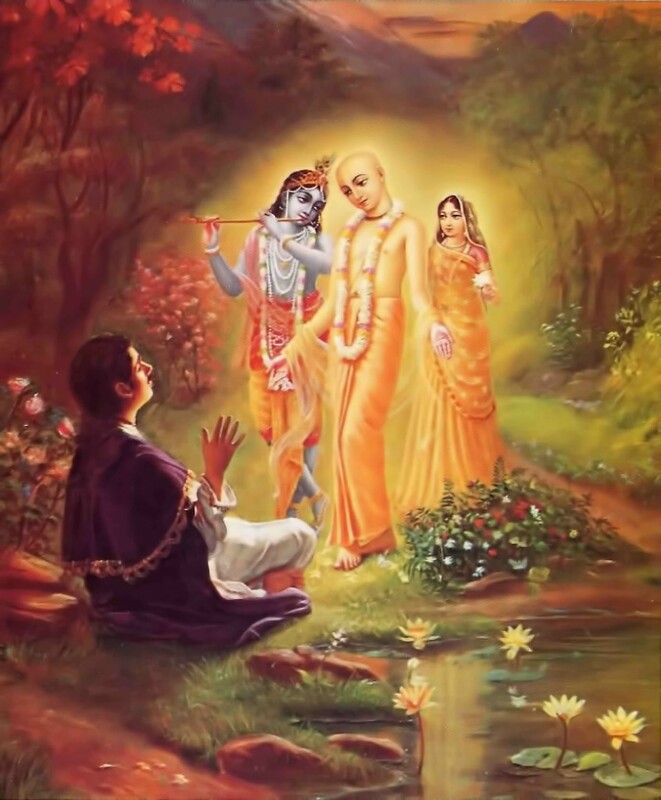 Sri Caitanya Mahaprabhu [pronounced Chaitanya] (February 27,1486 to 1534 A.D.) was born in Navadvipa, Bengal, on a full moon night during a lunar eclipse. It is typical for people to bathe in the Ganges during an eclipse and chant the Lord’s holy names for spiritual purification. So, everyone in the area was chanting the holy names when He was born. His parents, Jagannatha Misra and Sachidevi, gave Him the name of Vishvambhara, meaning the support of the universe, because astrologers had predicted His super human qualities and that He would deliver the people of the world. He was also nicknamed Nimai because He had been born under a nima tree. I have always liked the following verses from the Sri Caitanya-caritamrta. They remind me to slow down, chant nicely, and don’t be attached. 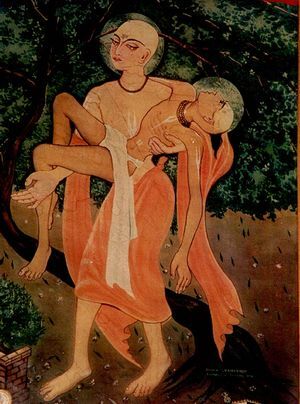 Since Śrī Caitanya Mahāprabhu was omniscient, He could understand Raghunātha dāsa’s mind. The Lord therefore instructed him with the following reassuring words. “Be patient and return home. Don’t be a crazy fellow. By and by you will be able to cross the ocean of material existence. The summary of the chapter is given by Śrīla Bhaktivinoda Ṭhākura in his Amṛta-pravāha-bhāṣya as follows. 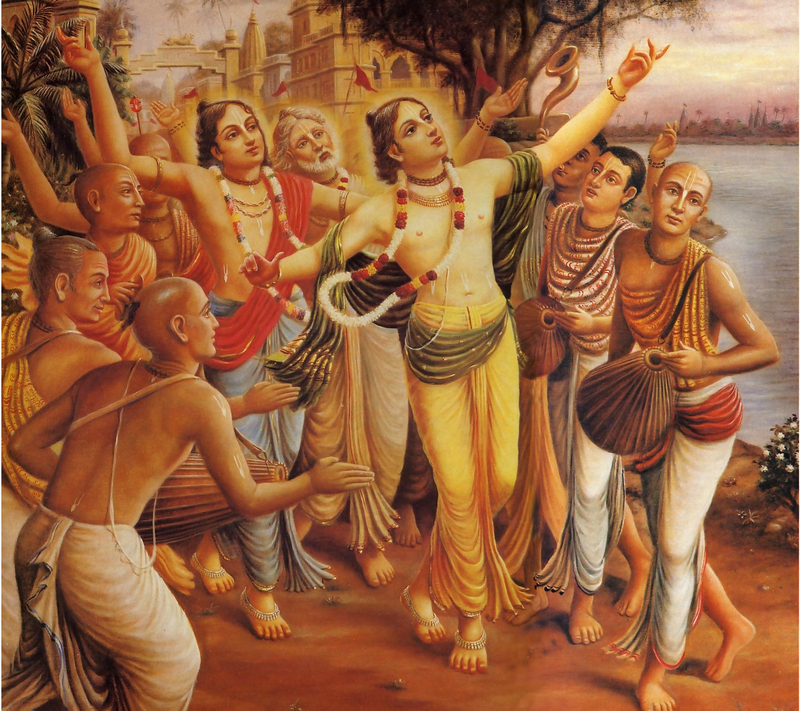 In this chapter, Brahma Haridāsa Ṭhākura gave up his body with the consent of Śrī Caitanya Mahāprabhu, and the Lord Himself personally performed the funeral ceremony and carried the body to the sea. 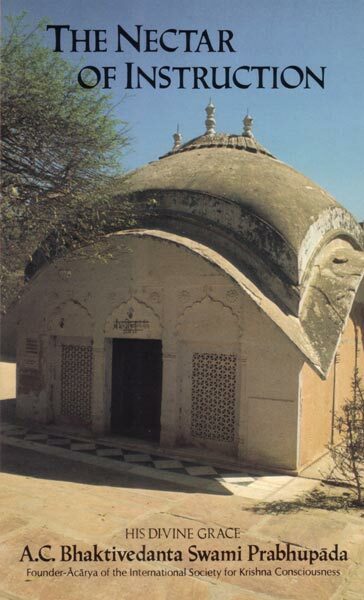 He personally entombed the body, covered it with sand, and erected a platform on the site. After taking bath in the sea, He personally begged prasāda of Jagannātha from shopkeepers and distributed prasāda to the assembled devotees. The special function of Śrīla Rūpa Gosvāmī is to establish the feelings of Śrī Caitanya Mahāprabhu. These feelings are His desires that His special mercy be spread throughout the world in this Kali-yuga. His desire is that all over the world everyone, in every village and every town, know of Śrī Caitanya Mahāprabhu and His saṅkīrtana movement. These are the inner feelings of Śrī Caitanya Mahāprabhu. Śrī Rūpa Gosvāmī committed to writing all these feelings of the Lord. Now again, by the mercy of Śrī Caitanya Mahāprabhu, the same feelings are being spread all over the world by the servants of the Gosvāmīs, and devotees who are pure and simple will appreciate this attempt. As concluded by Śrīla Kṛṣṇadāsa Kavirāja Gosvāmī, however, those who are on the level of hogs and dogs will never appreciate such a great attempt. Yet this does not matter to the preachers of Śrī Caitanya Mahāprabhu’s cult, for all over the world they will continue to perform this responsible work, even though persons who are like cats and dogs do not appreciate them. Recently there has been some discussion on the internet about Jayadvaita Swami’s remarks on kirtana standards in his Kirtan Seminar lectures. I cannot repeat here, what he said on the YouTube Lecture, finding it offensive and not worthy of repeating. 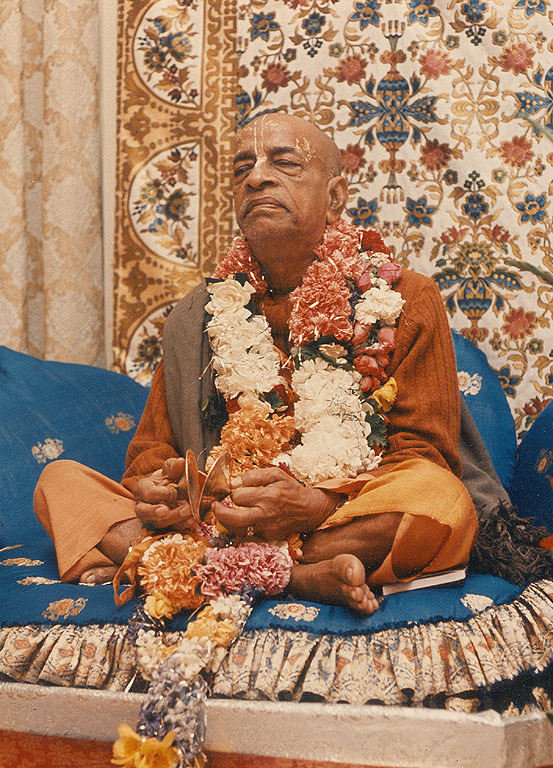 Rather than dwell on the negetive statements of Jayadvaita Swami, we thought it better to repeat the words of the bona fide spiritual master Srila Prabhupada, who so nicely describes the characteristics of the “Bona Fide Guru” in the pages of the Sri Caitanya-caritmrta. …The guru must be situated on the topmost platform of devotional service. 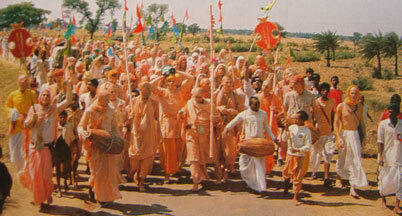 There are three classes of devotees, and the guru must be accepted from the topmost class. The first-class devotee is the spiritual master for all kinds of people. It is said: gurur nṛṇām. The word nṛṇām means “of all human beings.” The guru is not limited to a particular group. It is stated in the Upadeśāmṛta of Rūpa Gosvāmī that a guru is a gosvāmī, a controller of the senses and the mind. Such a guru can accept disciples from all over the world. Pṛthivīṁ sa śiṣyāt. This is the test of the guru. Not only is this one of my most favorite pictures from the Śrī Caitanya-caritāmṛta, but this is one of the most nectarean chapters as well. This is a continuation from our previous post Drops of Nectar, and includes texts 279-289 from chapter eight of the Madhya-lila entitled “Talks Between Śrī Caitanya Mahāprabhu and Rāmānanda Rāya”. Lord Śrī Kṛṣṇa is the reservoir of all pleasure, and Śrīmatī Rādhārāṇī is the personification of ecstatic love of Godhead. These two forms has combined as one in Śrī Caitanya Mahāprabhu. 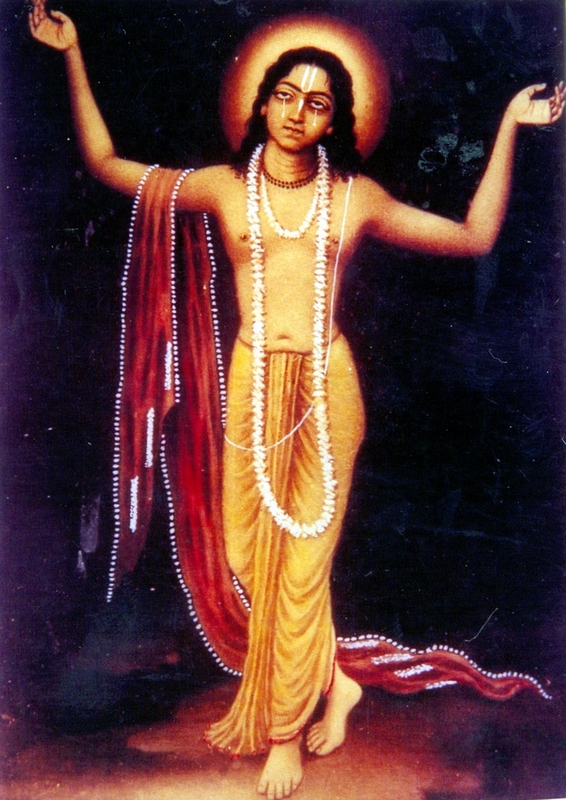 This being the case, Lord Śrī Caitanya Mahāprabhu revealed His real form to Rāmānanda Rāya. 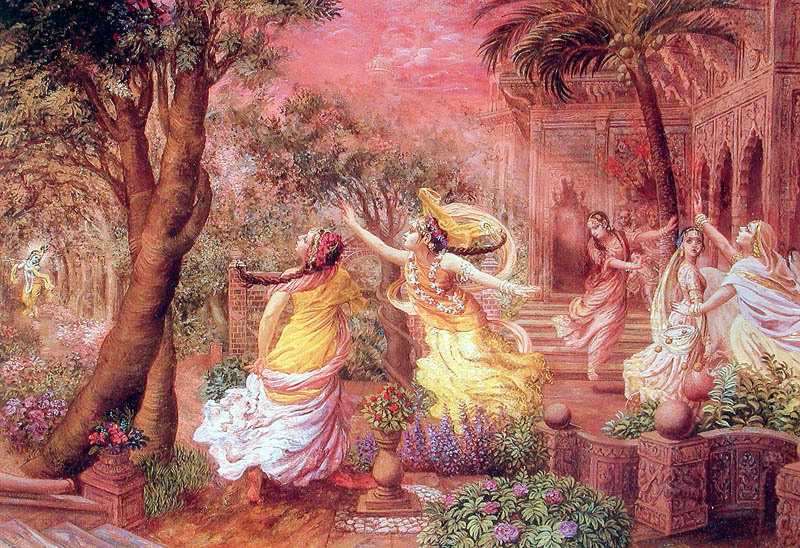 This is all but and introduction to one of the very best, sweetest, chapters in the KRSNA Book “The Gopīs’ Feelings of Separation” which we have posted here in its entirety. …I think that His Divine Grace Bhaktisiddhānta Sarasvatī Ṭhākura is always seeing my activities and guiding me within my heart by his words. As it is said in Śrīmad Bhāgavatam, tene brahma hṛdā ya ādi-kavaye. Spiritual inspiration comes from within the heart, wherein the Supreme Personality of Godhead, in His Paramātmā feature, is always sitting with all His devotees and associates. It is to be admitted that whatever translation work I have done is through the inspiration of my spiritual master because personally I am most insignificant and incompetent to do this materially impossible work. I do not think myself a very learned scholar, but I have full faith in the service of my spiritual master, His Divine Grace Śrīla Bhaktisiddhānta Sarasvatī Ṭhakura. If there is any credit to my activities of translating, it is all due to His Divine Grace. Certainly if His Divine Grace were personally present at this time, it would have been a great occasion for jubiliation, but even though he is not physically present, I am confident that he is very pleased by this work of translation. He was very fond of seeing many books published to spread the Kṛṣṇa consciousness movement. Therefore our society, the International Society for Kṛṣṇa Consciousness, has formed to execute the order of Śrī Caitanya Mahāprabhu and His Divine Grace Śrīla Bhaktisiddhānta Sarasvatī Ṭhakura. 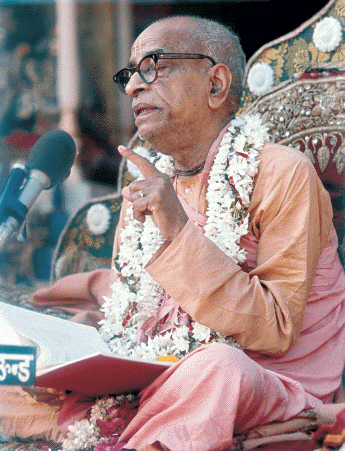 Although Srila Prabhupada gives all credit to his spiritual master, we give all credit to him. All Glories to Srila Prabhupada! 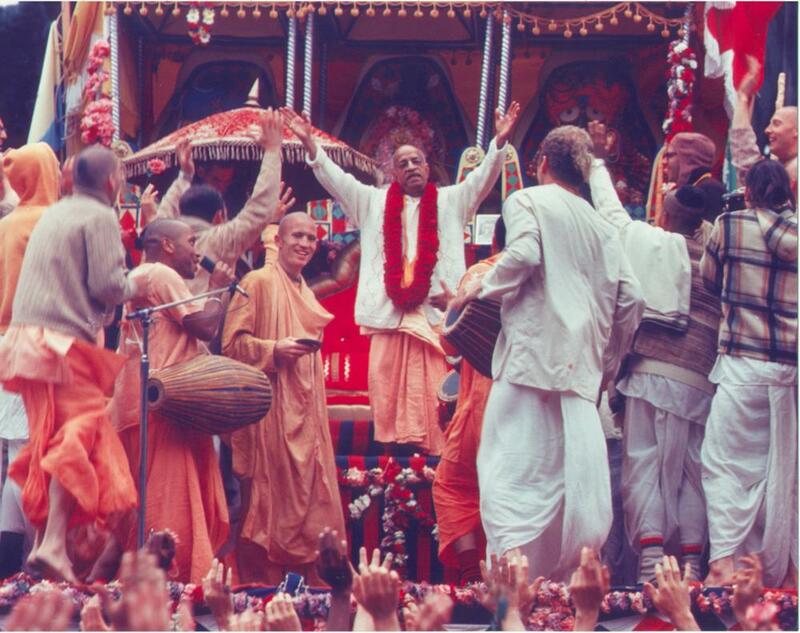 Today as most of the world celebrates Gaura Purnima, (Appearance day of Śrī Caitanya Mahāprabhu), I was reminded of a lecture given by His Divine Grace Srila Prabhupada on Gaura Purnima in Mayapur, India, March 16th, 1976. 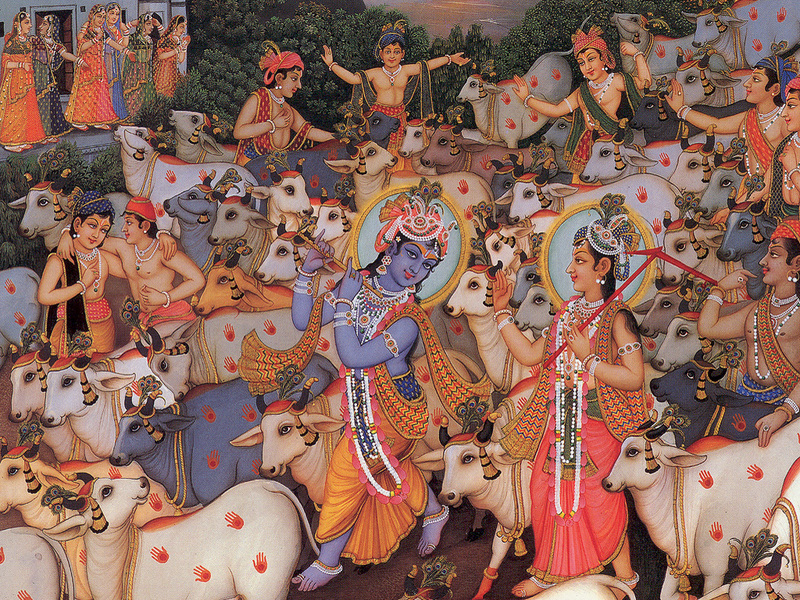 So with pleasure we are posting this famous Gaura Purnima lecture in its entirety. Prabhupāda: This will make your life perfect. The Kṛṣṇa consciousness movement introduced by Lord Caitanya is extremely important because one who takes to it becomes eternal, being freed from birth, death and old age. People do not recognize that the real distresses in life are the four principles of birth, death, old age and disease. They are so foolish that they resign themselves to these four miseries, not knowing the transcendental remedy of the Hare Kṛṣṇa mahā-mantra. Simply by chanting the Hare Kṛṣṇa mahā-mantra, one can become free from all misery, but because they are enchanted by the illusory energy, people do not take this movement seriously. Therefore those who are actually servants of Śrī Caitanya Mahāprabhu must seriously distribute this movement all over the world to render the greatest benefit to human society. 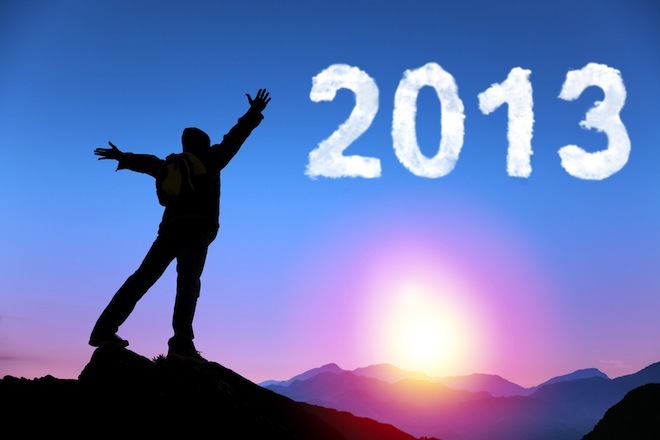 Every year it seems I make the fruitless attempt to write down my New Year’s Resolutions, vowing to do less of this and more of that. But this year, I am just going to try to be a better human being. I am just going to try to develop the qualities of a devotee, which are 26 in number, and try to get myself free from material entanglement and go Back Home, Back to Godhead. The Lord is satisfied by the development of the transcendental qualities of the living entities and not by artificial performance of sacrifices and mystic yoga. In other words, unless one is fully qualified to become a pure devotee of the Lord, one cannot expect to be liberated from material entanglement. 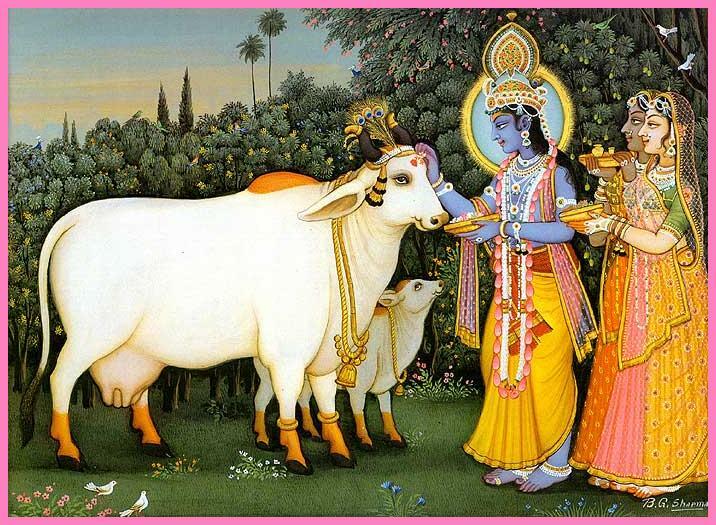 “According to Śukadeva Gosvāmī, Kṛṣṇa had unlimited cows and cowherd boys with Him. No one could count their actual number. “All the cowherd boys had unlimited calves. 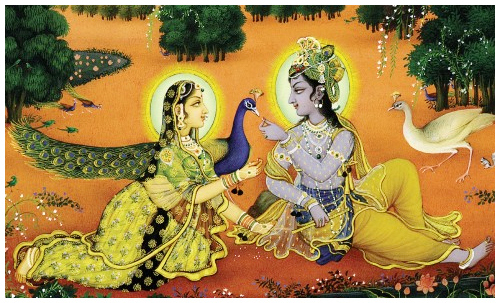 Similarly, their canes, flutes, lotus flowers, horns, garments and ornaments were all unlimited. They cannot be limited by writing about them. Very Important verses and purports from Srila Prabhupada’s Sri Caitanya-caritamrta, on the Mercy of Śrī Caitanya Mahāprabhu. The Bhaṭṭācārya replied, “A person who has received but a small fraction of mercy from Śrī Caitanya Mahāprabhu can understand that He is Lord Kṛṣṇa. No one else can. “If the mercy of Śrī Caitanya Mahāprabhu is not bestowed upon a person-regardless of how learned a scholar that person may be and regardless of his seeing or listening-he cannot accept Lord Caitanya as the Supreme Personality of Godhead.